startling to many observers who are curious about human origins. The truth is that both sides agree on this point — but they have opposing views on what took place instead. Those who take as literal history the creation accounts in Genesis scoff at the contention that "man came from monkey" or that humans evolved from primate ancestors. They believe humans' physical bodies were created ex nihilo and as-is. Evolutionary biologists do believe that humans evolved from primate ancestors, but those ancestors were not apes or monkeys. Apes are modern creatures, just as humans are. So biologists believe in "common ancestor to human" evolution, as well as "common ancestor to ape" evolution. are all tailless and, except for gorillas and humans, are gifted climbers. Gibbons are sometimes called the "lesser apes," and their clade was the first to branch off our lineage. Molecular evidence suggests this event took place about 12 to 18 million years ago, although the proto-gibbon fossil record is scanty. The first of the so-called "great apes" to branch off were the orangutans, about 12 million years ago, with good proto-orangutan fossil species known from 10 million years ago. 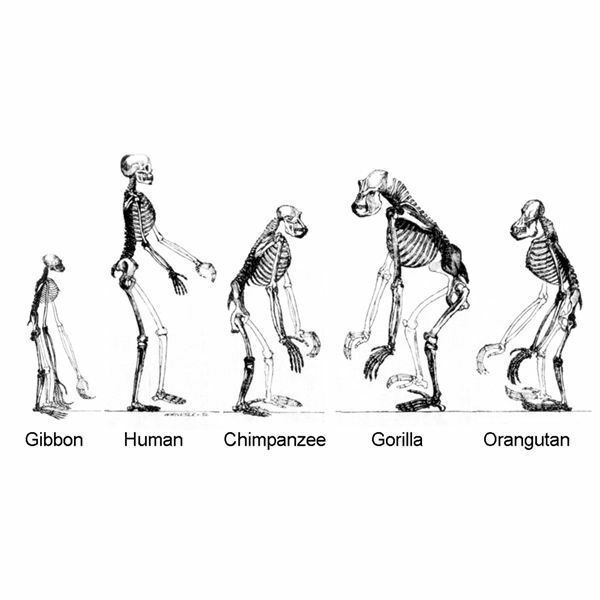 In evolution, it is important to understand that there were no gibbons nor orangutans 10 million years ago. There were only the ancestors of these groups, and they were not modern apes any more than their contemporary cousins were modern humans. Likewise, there were no gorillas 8 million years ago, when the gorilla lineage is thought to have separated from the clade leading to humans and chimpanzees. The common ancestor of these three groups may have been the fossil primate Nakalipithecus or a similar species. Some time after that, perhaps 7 million years ago, the chimpanzee ancestor split from the human ancestor. No species in the human lineage after this final split is an ape. Many species branched off from the lineage that led to modern humans, including species belonging to Ardepithecus, Australopithecus, Paranthropus, and Kenyanthropus. Later, several species evolved that are considered part of our genus, including H. habilis, H. erectus and H. neanterthalensis (Neandertal Man). Yet none of these species, even ones that may be direct ancestors rather than cousins, are considered apes. In fact, apes make up a paraphyletic group. 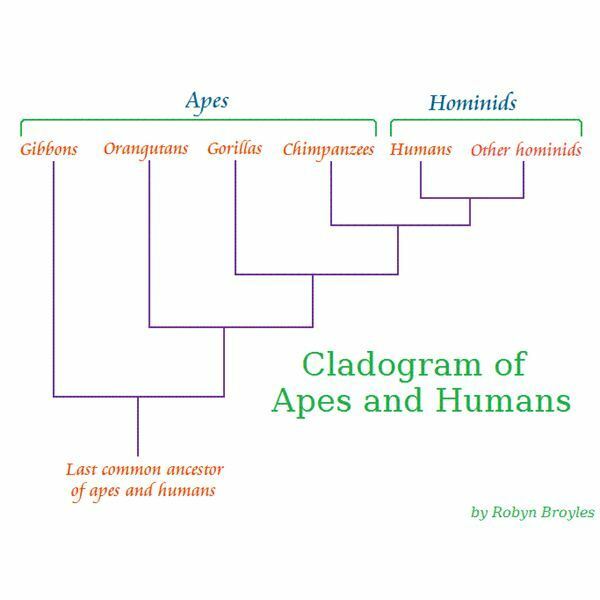 It is defined by all of Hominoidea except humans, or put another way, all descendants of our last common ancestor (right before the gibbon lineage branched off) except for us. Biologists consider it a historical evolutionary fact that humans are primates and that an early-primate to human evolution occurred. Apes are no more than cousins that exist outside this evolution timeline. Some creationists may mistakenly believe that evolution proposes that an ape to human evolution took place, but they are correct that evolution indicates that humans are related by ancestry to apes.